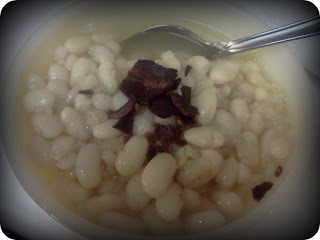 *Either soak beans overnight or bring them to a boil in 8 c. of water and then take off the heat and let soak for 1 hour. 1. Combine 8 c. water, soaked beans, bouillon, onions, garlic powder and bay leaf in large pot. Bring to boil, then let simmer for 1 hour covered and 30 minutes uncovered. 2. Serve hot, with bacon if desired.